Ummati, ummati. My nation, my nation. This will be the response of that great lofty being, of whose light consists of the initial essence of all creation, on that most-certain Day. He will step in and intercede for his brothers and sisters in a time where there is naught time, nor anyone to turn to; he is the one that will supplicate in a way that no other being has ever supplicated before. He will on that Day pray for you and your salvation. He will implore your pardon and your acceptance into the Garden. He will petition for his brothers out of the mercy and compassion that permeates the very principle of his soul. This man is Muhammad and he is a man most unlike other men. 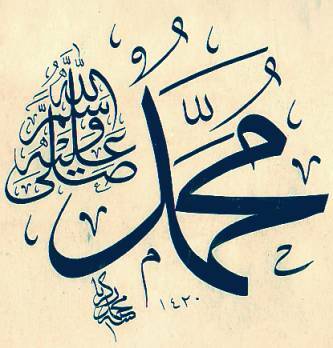 Salla Allahu alayhi wassalam. The creation sighed a sigh of anxious relief at the hearing of his coming. Mountains trembled, clouds gathered, the trees swayed in their yearning. Beasts roared and birds soared, their shrills exponentially magnifying as the praises catalyzed more praise throughout the realms. The sun set and the moon rose in honor of Ahmad, the pure of the Adamic race. He was always a sight to see and a delight to hear, but it was the unfelt and unspoken truths one felt in his presence that drew near so many of his family, friend and foes’ hearts. All was captivated by his disposition. Medium build, wide shouldered, brawny. Not too tall nor too short. Wide hands and firm feet, a mouth full of pearls- physically and vocally. His speech perfected in humble strength, sweet and succinct. And his fragrance… oh his fragrance like that of the Garden. Always clean and always scented, as if freshly bathed in the finest musk. Always anointed in the best of oils and to feel him walk by was to whiff the scent of heavenly ambrosia. Yet even in his beauty, lay an indescribable presence of majesty. Living the life of a warrior, his quarters reflected that reality of his message. The truth must be spread, the mission must be accomplished; thus his humble home decorated with the finest shields, swords, bows and arrows. Coming out of his house dressed for battle, he had the conviction of an emboldened falcon cruising comfortably, coolly and patiently planning for divine Providence to lead him and his saints across the threshold into the testing ground of hearts. Warrior monks was what he produced, manifesting alongside him ranks and ranks of men who would train by day and pray by night, head humbled low in the remembrance of the Most High. There was a perfected balance about him and everyone who saw the Praised One could not help but join the melodious ode of the creation to him. ‘Ahhmmaaad’ was what the angels sang and the resonance of their tune engulfed the entire world, anyone joining the song during his blessed 63 years on Earth instantly transformed and illumined. This was the Ahmadi affect. This was the Muhammadan light. The frequency of love, reaching into the hardest and darkest crevices of souls and reorienting the mirrors therein so light became refracted in it ever so wholly; this was only a touch and a caring that one appointed by God as the ‘Mercy of the Worlds’ could muster. He would move killers, highway robbers and drunken fornicators to become worldly ascetics and otherworldly gnostics; transform baby-murderers to romantic desert wanderers, intoxicated in the knowledge of the Truth-this was what our Master did. This is the Muhammadan reality. The light created before all lights; the very quintessential manifestation of the Names of the One, tying together all the highest attributes of the Almighty into a package that merged the very heavens and earth into his purified soul. Commander of the stars, patron of the hearts. Willing leader of the faithful. Salla Allahu alayhi wassalam. This is our glory. This is the reality that is Ahmad which all souls call for and all lights derive from. Remember him now in all that he is, so that on that day when you journey through the firmament onto the platform of the Scale, you will know your intercessor. And he will know you. And you will love your intercessor. And he will love you. And God loves the love and so through him, He will accept you. Love him as he deserves to be loved, surely the Loving loves the Beloved.